My New Castle Industrial Railroad is set in a generic location. However, using ideas from prototype locations helps me immensely when planning layout scenery. Although I pull mini-scenes and details from many different geographical locations, there is no substitute for using an actual area to achieve the overall layout atmosphere that I'm after. 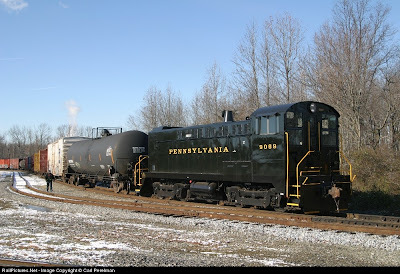 My scenic inspiration is a Norfolk Southern industrial branch located in Lancaster, Pennsylvania. The "North Side" industrial lead is located just east of NS' Dillerville Yard. The branch diverges from Amtrak's electrified Harrisburg - Philadelphia mainline at Cork Interlocking, crosses Manheim Pike, then meanders northwest to serve several industries...including Packaging Corporation of America and RR Donnelly. The photo below (taken in 2006) looks west from the SR 72 bridge. The North Side is the track at far right, curving behind the Lancaster Malleable Castings plant toward Manheim Pike. The huge facility at left is the Armstrong Flooring plant. That's NS local H23 and its actually backing east out of Dillerville yard. The train will reverse through Cork Interlocking, then cross over to the westbound main. 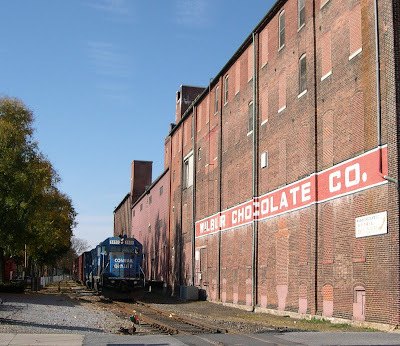 The local will travel a short distance west, then shift the Alumax plant before making a run up the Lititz Secondary. Sadly, all the industrial buildings in this photo are gone today! This Google Street View below looks south from Manheim Pike. You can see that Lancaster Malleable Castings is gone and the North Side runs through the remaining debris field. Catenary in the background is Amtrak's Keystone main. Of course on my New Castle Industrial, the Ann Street overpass takes the place of Manheim Pike. Across the street, McMinn Asphalt batch plant makes an interesting scene. I am modeling McMinn's equipment storage yard on the layout. My NCIR is an independent operator that purchased industrial trackage cast-off by a Class I railroad. Interestingly, this scenario almost played out on the North Side before the Conrail. split. Apparently the sale fell victim to associated moratorium on line sales prior to the takeover by NS/CSXT. So, the prototype North Side serves my scenic purposes pretty well. The area will offer plenty of ideas to copy from! A SMS Rail crew prepares to drill inbound cars at the Pureland Industrial Park in Swedesboro, NJ. Photo by Carl Perelman courtesy of railpictures.net. Below is a video I shot in 2009, showing an SMS Rail crew switching within the Pureland Industrial Park in Swedesboro NJ. Trackage at this end of the industrial park is very simple, nearly identical to the New Castle Industrial Park plan. There is a mainline/interchange track, a siding used to store cars, and a warehouse spur (in this case the Home Depot Lumber Distribution Center). A Conrail Shared Assets local shoved inbound cars onto the interchange track from the east. The video opens with the SMS crew rolling up to the interchange from the west to classify and spot the cars. The video follows the crew as they drill the cars via switchlist using the mainline and siding. 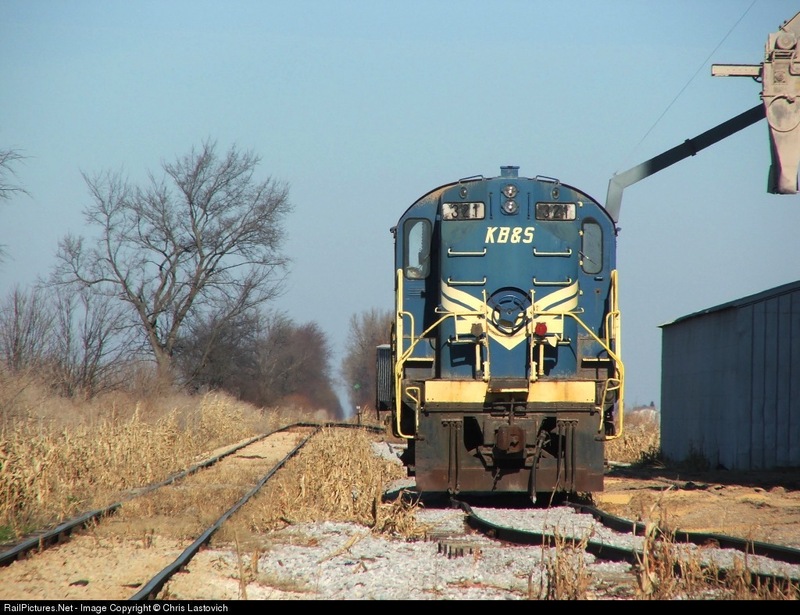 Watching a savvy crew shift railcars can be fascinating. Note how the conductor and brakeman work efficiently as a team. One is making cuts and hitches, the other tends the main switch. Later, the brakeman rides a few carlengths, then drops off so that he is in a position to make a cut after the conductor makes the hitch. Using similar practice, even small layouts like the NCIR can provide three people (engineer/conductor/brakeman) with an hour or more of fun. Notice how the crew begins by making the "big pull", then effectively builds two trains by dealing cars into the siding and interchange track. This method is much quicker than "cherry picking" individual cars, yet the shifting still takes some time. And sorting the interchange was only half the day's work. The crew still needed to pull the Home Depot spur, sort out empties vs. cars to be respotted, then shove the new loads and respots back into the warehouse. SMS Baldwin 9069 from Jack Hill on Vimeo. My goal is for the O Scale NCIR to give operators and viewers the same perspective as seen in the video. The track is near eye level, resulting in a view like that of a conductor on the ground. 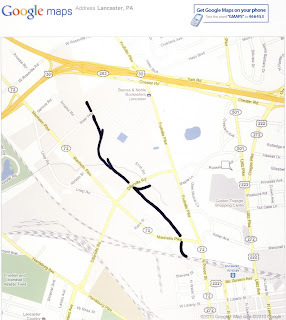 My main track and siding are on a convex curve, so I have to "walk the train" to find car numbers and make cuts. The size of 1/48 scale locomotives and rolling stock nicely captures the mass and inertia of the real thing...i.e. sometimes I really do need to put slack on the pin to uncouple! My backdrop is 1/4" Masonite hardboard screwed to a frame of 1" x 3" birch. I ripped the strips from a single 4 x 8 sheet of birch plywood. I painted my backdrop using Sherwin Williams "Soar" for the upper portion of the backdrop color, and "Sonething Blue" toward the horizon. The resulting blend nicely simulates a muted November sky. I appreciate all your comments and feedback regarding the blog. It seems that a lot of folks are interested in prototype operations that take place on simple track arrangements. That being said, let's look at a transload facility that offers a lot of switching potential on a small amount of track. The company is FMC. The commodity, soda ash (Sodium Carbonate to be proper). 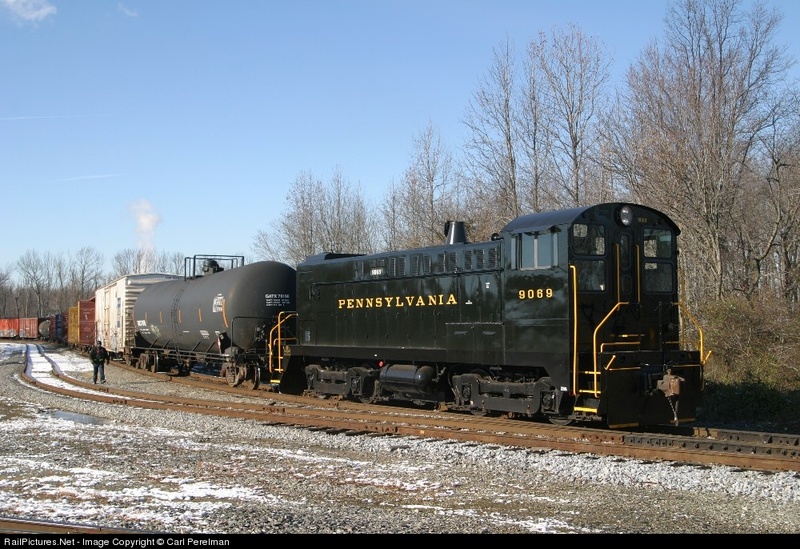 PPG operates a glass plant, located along Norfolk Southern and served by an NS crew. NS delivers and spots all sand and limestone necessary for glass production. PPG needed more capacity for receiving and storing soda ash, the third ingredient in glassmaking. Rather than rebuild their existing rail infrastructure, PPG and FMC Chemical worked out a unique alternative. Hoppers of soda ash, loaded in Wyoming, are delivered to our railroad. 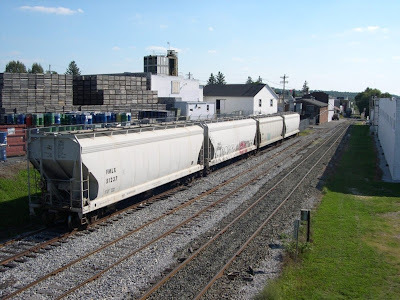 We deliver the hoppers to a spur near the north end of the railroad, just a few miles short of the NS interchange. Here, the soda ash is transferred into highway trailers and trucked the final miles over to PPG. All of the soda ash comes to us via CSX, so perhaps PPG/FMC are saving additional money through the non-NS routing. FMC leases a spur track, which holds 4 three-bay hoppers, as well as the former railroad depot that serves as a job office. Surrounding the spur and depot is a gravel lot. Soda ash is loaded into trucks with a self-propelled conveyor unit. This unit moves from car to car, placing its low-profile horizontal belt under the individual hopper bays. Semi trucks make round trips from the spur to PPG’s plant, where the soda ash is stored in silos. PPG goes through a lot of soda ash, so anywhere from 1 to 4 cars are spotted per day here. Just north of the transload spur, the railroad constructed another spur that holds 5 hoppers. Loaded hoppers are stored here, waiting their turn to be unloaded down at FMC. There is also a runaround track here, since we often turn at this station if there is no work to be done farther north. Left to right: storage track, run-around siding and mainline. The FMC spur is in the far background. The soda ash hoppers are spotted in date order and come in several series: 1000; 40,000 and 50,000 numbers. Due to nuances in car height (1000’s bays are lower than 40,000’s and 50,000’s), FMC requests that the second car from the switch (the #2 car) be a 40 or 50. The elevation of the spur rises slightly here and FMC has difficulty getting their unloading conveyor beneath a 1000 series car at this spot. So say that FMC has two empties today…the first and second car from the switch. You have two hoppers in your train (a 40,000; followed a 1000). If you simply pull the empties and shove in the two loads, you will have placed the 1000 car in the #2 spot, where FMC can't unload it. Instead, you need to make some extra moves to swap the order of the two cars in your train. Also, FMC usually begins unloading the car nearest the switch and works their way back. Sometimes the car at the end of the spur gets neglected and will not get unloaded fast. When that last car has been sitting loaded for a while, you might shuffle it so that it becomes the first car nearest the switch (thus getting unloaded the next day). Little details make shifting a siding interesting! On some days, the storage track is full and you will have no hopper cars in your train. Thus you dig loads out of the storage track for spotting at the unloading spur (minding the location of the 1000's remember:-) ) Other days, one or two cars in your train will get spotted on the unloading spur and all others will go to the storage track. Some days loads come from your train and from storage. As conductor, it’s up to you to figure out the most efficient way to get cars where they need to be. The cool thing is that by modeling an industry like this, you can make life as simple or as complicated as you’d like, depending on how much time you have for an operating session. FMC has the first two cars on the spur unloaded. The third car (still loaded) hasn't been there that long. However, the 4th car at the end of the spur was spotted a week ago. It is also a 1000 series car. There are three loaded hoppers in our train and two more are on the storage track. The cars on the storage track are older date-wise than the ones in our train. So, we need to (1) pull the two hoppers from storage and spot them on the FMC spur; (2) move the #4 car to the #1 spot so that it will get unloaded next; (3) place the three loads in our train on the storage track; and (4) take the two empty hoppers back south to the CSXT interchange. Drop the three loads in our train on the main, leaving room for 1 more hopper before the fouling point. Go in and grab all four hoppers off the spur (2 empties and 2 loads). Cut away with the 2 empties and 1 load. Spot the load (the original #3 car) as the new #4 car, leave the two empties coupled to it for now. Pull ahead with just the locomotive to clear the switch. Tie onto the cars on the main. You now have the engine, the 1000 car and the three loads you brought with you (in that order). Pull everything ahead to clear the switch. Back into the spur and grab the 2 empties. Pull out, leaving the switch lined for the spur behind us. Keep pulling north until the last car clears the south run around switch. Throw the south switch for the siding, since we are right beside it. Now cut away from the 3 loads that were originally in our train, keeping only the 1000 car we picked up on the FMC spur. Go into the storage track and grab the 2 loaded hoppers there. Pull them out to the main, then shove ahead to couple to the 3 loads we dropped on the main. Place the 3 loads on the storage track. Now shove south with the 1000 car and 2 loads we picked up on the from the storage track. Shove down and spot these three cars on the FMC spur. (Note that, because we left the FMC spur switch lined and also lined the south siding switch in step 9, our engineer does not need to stop the heavy train for us to line them now. Anytime we can save our engineer a little grief the better). After spotting the cars at FMC, pull ahead so the locomotive is between the switches for the spur and south run around. Throw both back for the main. Now we'll couple to the 2 empties that we're taking back south, perform an air test, then depart. For our wheel report, we remembered to record all car numbers; the time we spotted all cars; and the track numbers that they all went to right? VIRTUAL SWITCHING ON THE NCIR! Simply click on a specific car to view its destination. Zoom in and out using the '+' / '-' keys, or move the layout left and right using the arrow keys. Click on the switches to throw them. I've included a switch list below, similar to what crews would receive at the beginning of the day. For a bit of background, you may wish to refer to my Trackplan and Operations and Layout Tour pages. Have fun! Run locomotive down and couple to cars on the interchange track. Uncouple RBOX 772. Pull the other two inbound cars clear of the switch. Still holding the two inbound boxcars, shove ahead and couple onto the cars standing on the storage track. Pull everything clear of the switch. Then shove ahead on the interchange track and couple to the lone RBOX 772. Make a cut and leave the CCLX 012 starch hopper and AGR 034 with the RBOX. Pull back clear of the switch. Shove ahead into the storage track and set out all four loaded boxcars that remain coupled to the engine. Pull back again to clear. Run ahead onto interchange and couple to the three cars. Make a cut , then pull back with just the AGR 034 to clear the switch. Shove into the storage track and couple. Make a cut and drop CSXT 174. Pull back to clear with all the other cars. Shove ahead onto the interchange track and drop RBOX 605. Pull back, then drop CSX 258 on the storage track, coupled to the CSX 174 car you dropped earlier. Make sure to leave enough headroom on the storage track so you can drop one more car in there a bit later. Pull back, then shove onto the interchange track and set out CSX 514 and AGR 034. Now all our cars are lined up for spotting on the PCA spur. Pull back. (Now you just have the light engine). Go into the plant spur. Couple all cars together from dock and warehouse. Pull back until the last car (NS 621) is just short of the fouling point. Cut and leave the NS car on the spur. Pull back to clear the switch. Shove ahead and drop RBOX 801 with the cars already on the interchange track. (Now we have all 6 of our cars for the warehouse and dock lined up in spot order). Pull back to clear switch. Shove into the spur and grab the lone NS car (621). Pull everything back again to clear the switch. Shove ahead and couple to cars on the interchange. Pull the whole string clear of the switch. Then shove ahead into the spur. Spot the 4 warehouse cars. Then cut, pull back and spot the two dock cars. Pull everything else back to clear the switch. The "no bill" ABOX 552 should be coupled right to the engine, followed by all the MTY's destined for the interchange. Shove ahead and drop the 4 MTY's on the interchange. Pull back. Shove ABOX 552 into the storage track. Pull the engine back to clear the switches. Last time I mentioned that I placed temporary track down on the layout, simply to judge how all elements will fit together. The overall picture is coming into sharper focus and I'm happy with what I see! We are standing near the right end of the layout at what is known as New Castle Junction (the eastern limit of NCIR ownership). The track running diagonal across the layout is the Conrail (now CSXT) main. The boxcars are on the CSXT/NCIR interchange track. The track in the foreground is the former Conrail New Castle Secondary main, now used by the NCIR as a storage track. There used to be a diamond crossing here, but it was removed when Conrail abandoned the New Castle Secondary east of the crossing. I plan to model the abandoned, overgrown ROW. The CSXT main will be well maintained code 148 rail on a nice bed of ballast. In contrast, the NCIR's track will be lighter weight. There will be a rusted signal standing guard at the former diamond, along with the foundation remains of a tower. Long ago, many trains must have passed through here every day! Above is an aerial view of the junction. 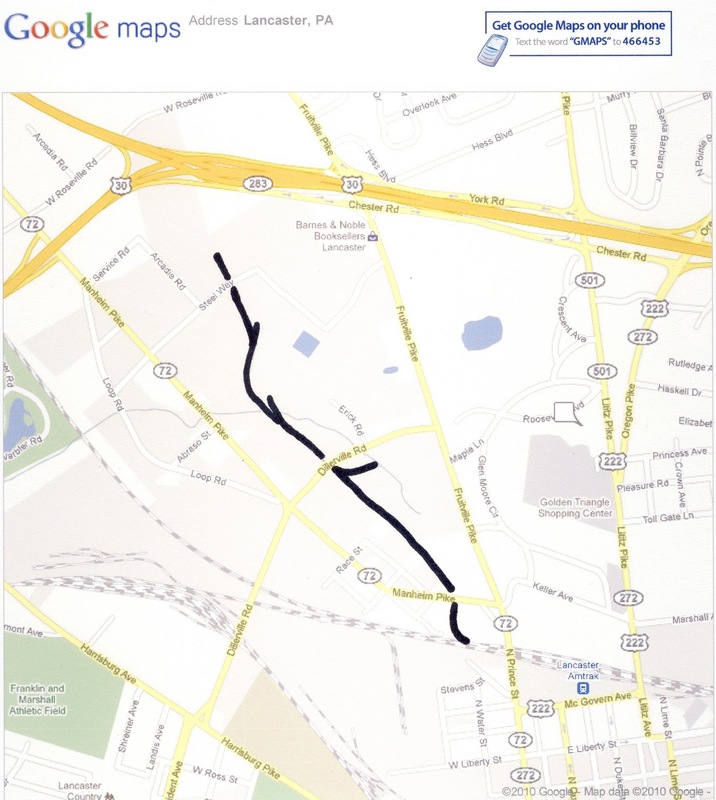 Note that the interchange track does not actually connect to the CSXT main. Rather, it climbs upgrade to join the main somewhere in the "off-stage" distance. We are now looking due west down the New Castle Industrial. The CSXT main is in the foreground. Left to right we see (1) the old Conrail main, now used for car storage; (2) the NCIR/CSXT interchange track; and (3) Packaging Corporation of America's warehouse and dock track (where the cars are spotted in the upper right of the photo. Looking east. Left to right: PCA's dock track (which will be on a higher grade); interchange track and old main. Cars are drilled into spot order using the interchange and old main. Overflow cars waiting to be spotted are stored on the old main. Picture an outdoor dock here, between the RBOX and the backdrop. Then picture a large warehouse where the cars in the background are spotted. The dock is where empty boxcars from the warehouse are reloaded with scrap cardboard. 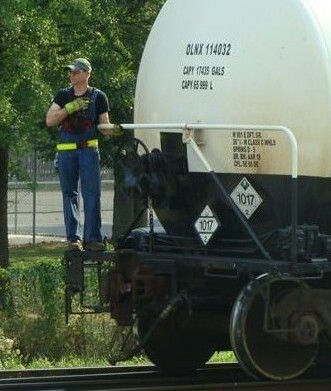 Tank cars of caustic soda are also unloaded here. Loads on the old main waiting to be spotted. A conductor spends a lot of time here, shifting out cars requested by PCA on a given day's switch list. In the distance is NCIR's RS-11, tied down awaiting the next day's switching chores. Above is an overall view of the layout. I'm excited! I think the O Scale New Castle Industrial will offer good operation and a variety of neat scenic elements in 18 lineal feet. I recently found this photo from August 2007, when we first looked at the house with our Realtor. This was the previous owner's workshop and storage room, which is now my railroad room. These last two photos were taken from roughly the same spot. Boy, the previous owners had a lot of stuff! Thanks for taking the tour!! The locomotive assigned to the NCIR is Alco RS11 #318, a former Kankakee, Beaverville & Southern ex BN nee NP unit. In reality, the locomotive is a brass import from Overland Models with a rebuilt drive train from Doug Cockerham. O scale New Castle Industrial Railroad from Jack Hill on Vimeo. Eventually, I will get the engine painted and weathered. 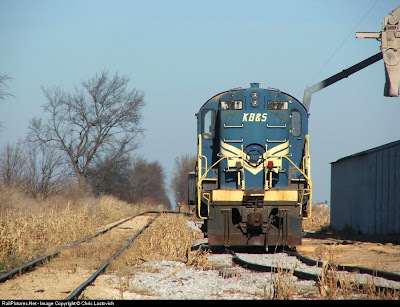 The locomotive will wear a well worn coat of blue and yellow, (like its former owner, the Kankakee Beaverville & Southern) with patched NCIR reporting marks. Former KB&S RS-11 #321 now drills grain hoppers for the CO-OP elevator in Darrow, Illinois. When KB&S retired their Alco fleet in favor of newer EMD power, several of the veteran workhorses migrated to shortlines and industrial switching operations. Hollow-core doors, $19.99 each from Home Depot, made benchwork construction a breeze. I fastened the doors to a 1" pine ledgerboard along the walls and used knee braces for support. I designed my benchwork to be portable in case we ever have to move. The layout sections are simply lag-bolted together as shown in the photo. The resulting benchwork is quite rigid and easily supports my body weight. I used green foamboard insulation from Lowe's as a scenery base. I initially used three inches of foamboard, which resulted in a track height of 53" off the floor. Upon placing temporary track and structure mock-ups, I found that 53" was a tad too low for my taste. I added another 2" layer of foam to bring the benchwork height to 55". I'm 5' 10" and 55" is about armpit height. I tested operations again before permanently attaching the additional foam layer, just to make sure that I could manually uncouple cars anywhere on the layout. The resulting 5" foam base layer allows for plenty of scenery below track level. I used a hand saw rather than a utility knife for cutting foam, cleaning up the edges with a drywall sanding block. PL300 is a great adhesive for attaching foam. This is the Wilbur Chocolate factory in Lititz, Pennsylvania. Wilbur receives inbound hoppers of sugar from NS. I really like the way the terrain slopes uphill, both to the rear and left-to-right. The building itself just begs to be located at the corner of a shelf layout. I notice more subtle details each time I visit and photograph the factory. Check out the truck dock between the main and the spur. There is just enough lawn and landscaping to give the hint of late fall. Also, the variety among the buildings themselves is terrific.